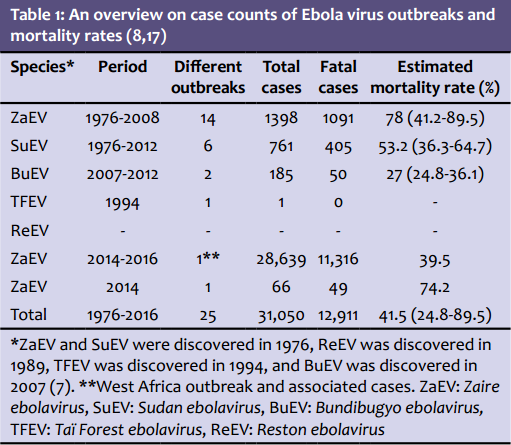 Ebola virus disease (EVD), formerly known as Ebola hemorrhagic fever, is a re-emerging zoonotic disease that has caused periodic outbreaks since the first reported outbreak in 1976. In 2014, in West Africa, the largest outbreak of Ebola virus in history emerged, affecting close to 30,000 people; more than 10,000 of these individuals died. This virus, which causes fatal hemorrhagic fever in humans and non-human primates, has the highest mortality rate (25-90%) among the viral hemorrhagic fever diseases. Ebola virus is transmitted through the blood and body fluids of infected animals and humans, as well as through contaminated materials. The virus is often spread in the hospital setting, and it is classified as a biosafety level 4 agent. Accordingly, diagnostic procedures and infected patient care should be performed at the highest safety levels. The potential therapies and vaccines against EVD have continued developing or been used in emergency situations during last outbreak. Some of these include the chimpanzee adenovirus type-3 and recombinant vesicular stomatitis virus-Ebola vaccines and new treatment modalities, such as passive immunization, brincidofovir, and ZMapp. Although these trials have shown different levels of success, there are no standardized treatments or vaccines that have been approved for humans. Such prevention is the only way to reduce human infection and the spread of outbreaks and is primarily based on personal protection measures and raising awareness of the risk factors.